CHICAGO – Just as there are tiers of animation in the United States, there are varying degrees of quality in our imported product as well. In the States, we know not everything can be Pixar. I suppose the French equivalent is not everything can be “The Illusionist” or “Triplets of Belleville”. And so we shouldn’t approach the recently imported 3D family film, “A Monster in Paris” with that standard of movie magic. The script for this fantasy is a bit thin and the visuals can be disappointing but it has a pleasant spirit, bouncy energy, and air of romance that allow it to work well for a rental. And it’s not weighed down with the gross-out jokes and pop culture references that often sink Hollywood 3D animated productions. “A Monster in Paris” has echoes of “Phantom of the Opera” for the younger romantic in your house. Writer/director Bibo Bergeron has worked on projects as varied as “Flushed Away,” “Caillou,” “Shark Tale,” “Bee Movie,” and “Asterix.” He brings a light touch to “Monster” which is the opposite of so many Hollywood productions that feel made by committee. I found parts of “Monster” a little dull but that alone is notable given the manic approach to storytelling so often approached by studios like Fox and Sony. Just because it’s 3D doesn’t mean it has to be in your face. Paris,1910. Panic sweeps the city as floodwaters rise and a monster is on the loose! From Bibo Bergeron, the director of Shark Tale, and starring Adam Goldberg, Jay Harrington, Bob Balaban, Sean Lennon, Vanessa Paradis, Danny Huston and Catherine O’Hara, A Monster In Paris is presented in stunning 3D for a spectacularly fun experience for the whole family. 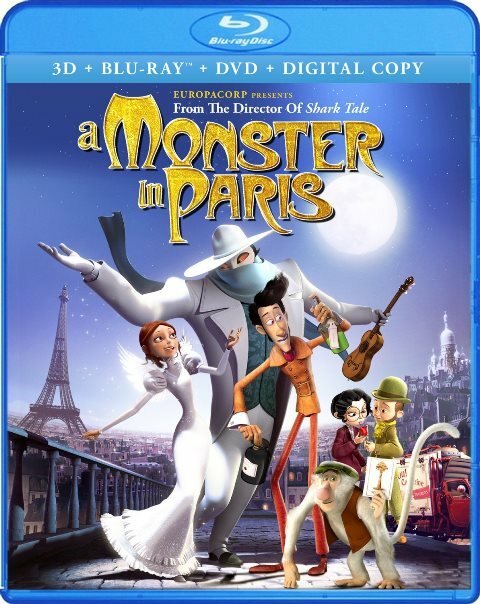 “A Monster in Paris” was released on Blu-ray and DVD on April 16, 2013.